Click here for a feature about the 2005 BIF President. As of Friday afternoons luncheon, 752 people had registered for the 37th Annual Beef Improvement Federation (BIF) meeting, which was July 6-9, 2005, at the Holiday Inn Grand Montana in Billings. The record number of attendees had opportunity to visit with industry leaders gathered to discuss advancements in genetic evaluation during the organizations annual meeting and research symposium. Themed Genetics for the Next Generation, the meetings general sessions and committee roundtables focused on reproductive efficiency, cow adaptability, multi-breed evaluation, Web-based decision-support tools, selection indexes and producer profitability. Click here to listen to streaming audio/video of many of the sessions. Browse through the Symposium papers page for proceedings of the conference. Browse the Newsroom page for summaries of the sessions written by API writers and grouped with the speakers PowerPoint presentations and their proceedings if available. Rishel Angus of North Platte, Neb., was named 2005 Seedstock Producer of the Year during Fridays awards lunch. Steve Suther, director of industry information for Certified Angus Beef LLC (CAB) won the 2005 Ambassador award. For more details about award winners, including Pioneer and Continuing Service award winners and seedstock and commercial nominees, see the Awards page. 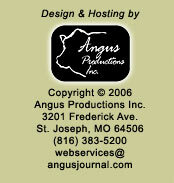 Angus Productions Inc. (API) is pleased to bring you online coverage of this event, with the sponsorship of Boehringer Ingelheim Vetmedica, Inc. Please let us now how were doing. Click here to send us your comments.